Enjoy the pictures you'll find here on these pages but please do not copy any of my designs or images in any manner without my permission. Mahalo! The following uke is available as of 3/23/17. 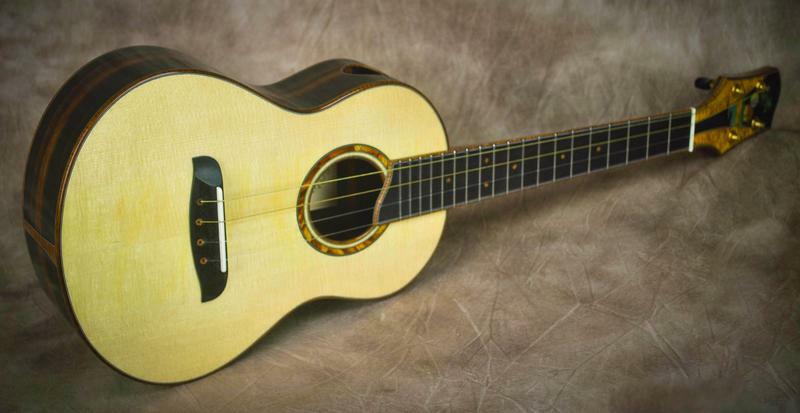 All other ukes on this page have been sold. I operate a small one man shop in rural Hawaii, run entirely on solar electricity. It’s not always fun or easy but it’s the only option I have given my remote location. 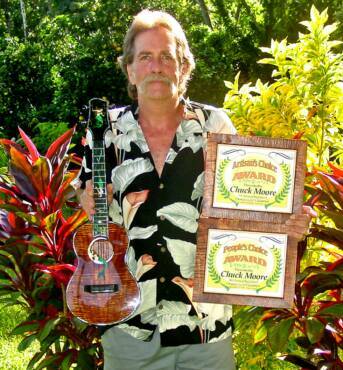 I make all of the wood elements that go into my ukuleles and every step of every process is done by my hands alone. I have no apprentices nor do I farm out any of my work, a practice that is so common in many luthier shops today. Because of the diversity of my work, it is difficult to quote exact prices. 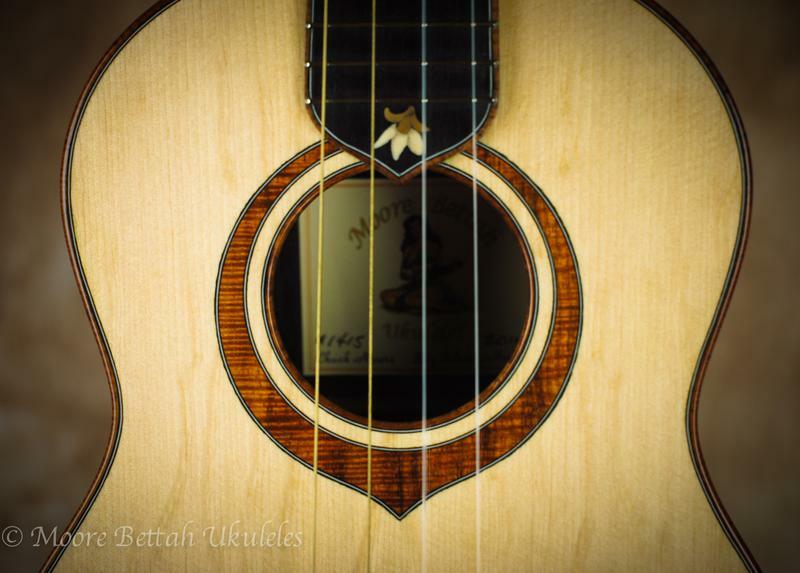 I can have as few as 40 hours or more than 150 hours into each uke I build (the average is 60 hours.) Rather than trying to provide you with a Chinese take-out menu of options I will attempt to simplify things with this rough guide line. 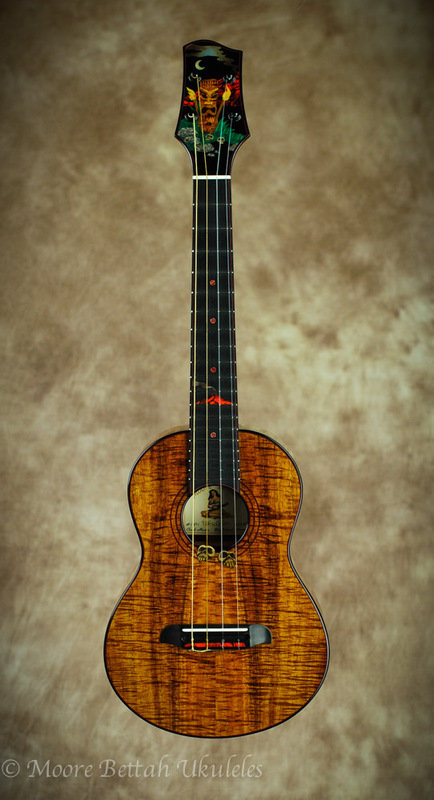 I no longer have a standard (NSB) model; each uke is unique as I combine different elements suited for that particular instrument. 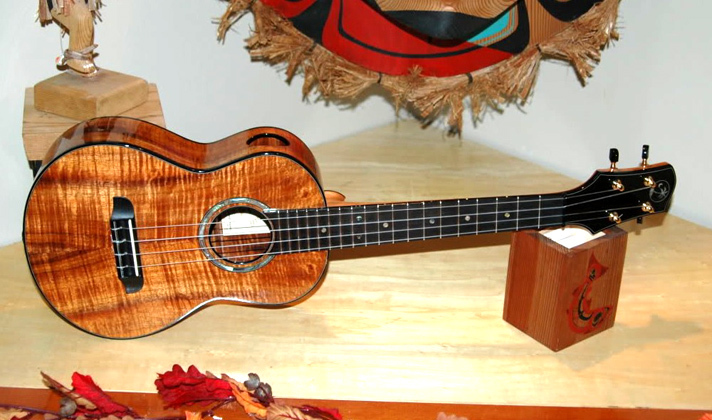 Base prices for my ukuleles are as follows: Tenor: $4500, Concert: $4400, Soprano: $4000. That’s where we start. The base price includes bindings & purflings on body, neck and headstock, rosette, bound sound holes, bone nut & saddle, bound side sound port, choice of premium tuners, glossy nitro cellulose finish and hard shell case. Popular options are slotted headstock ($200), arm bevels ($500), cutaways ($300), paua abalone purflings ($300+), pickups ($200) and inlays. 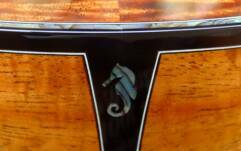 Premium wood upgrades are also available, ranging from $100 to $1000 when available. 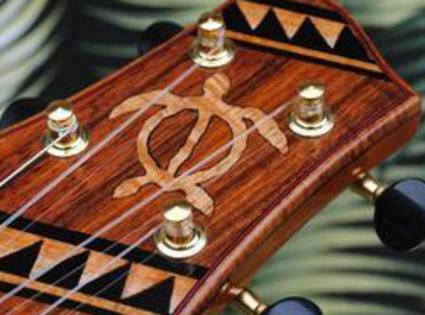 Inlays and other decorative elements can be as time consuming (or more) than building the uke itself and can drive prices over $10,000. At the current time I am not accepting any new custom orders as I focus on expressing some of my own ideas with my work. 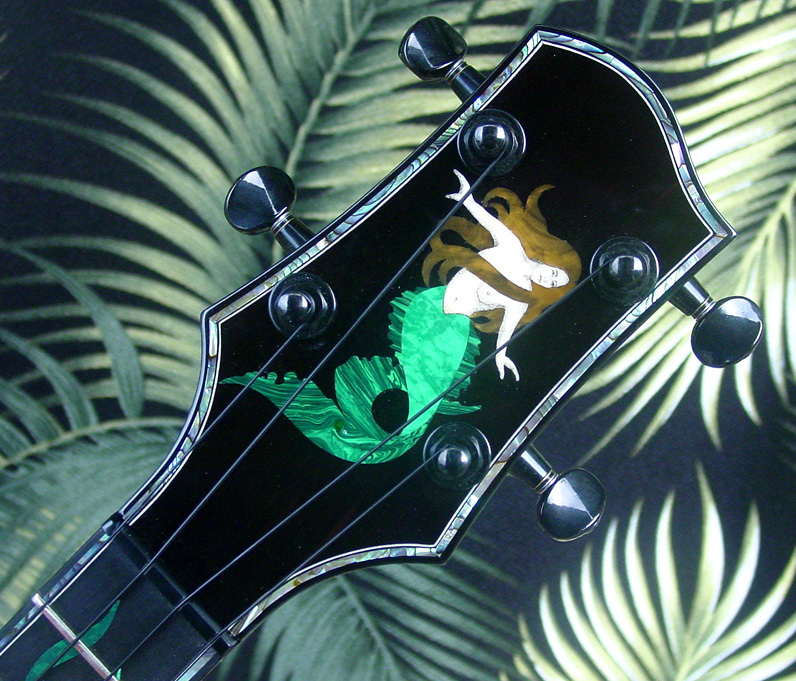 These and other non-commissioned ukes will be posted here when they become available. 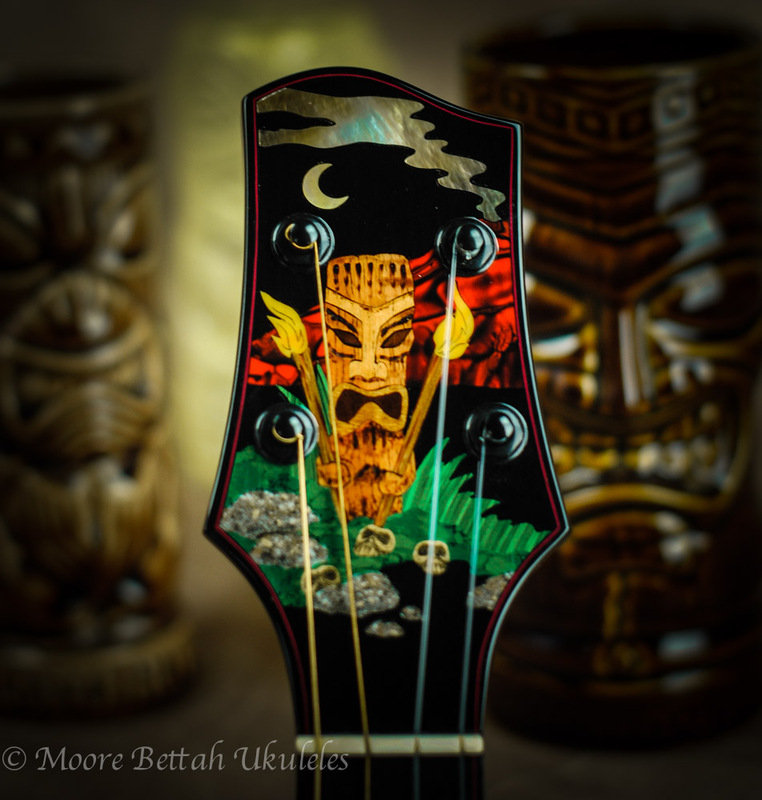 Here are some pictures of this year's People's Choice Award and Artisan's Choice Award winning ukulele presented at the 4th annual Big Island Guild Ukulele show in Kainaliu, Hawaii. 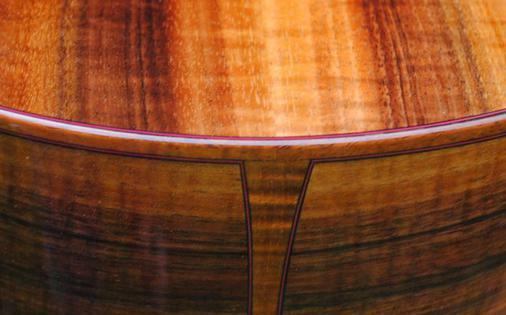 This all koa ukulele was challenging yet immensely satisfying to build. Living so close to nature in this beautiful Hawaiian environment was naturally very influential in my choice of whimsical designs depicting two mermaids frolicking in the sea and one dreamingly relaxing in a banana moon. 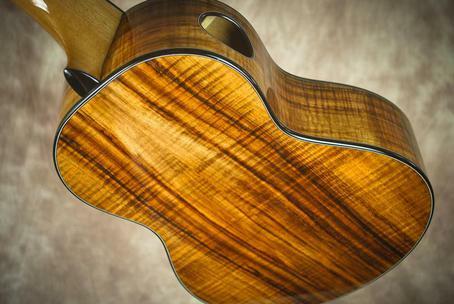 I use AAA Big Island curly koa for the body and ebony elsewhere including the fretboard and headstock veneer. 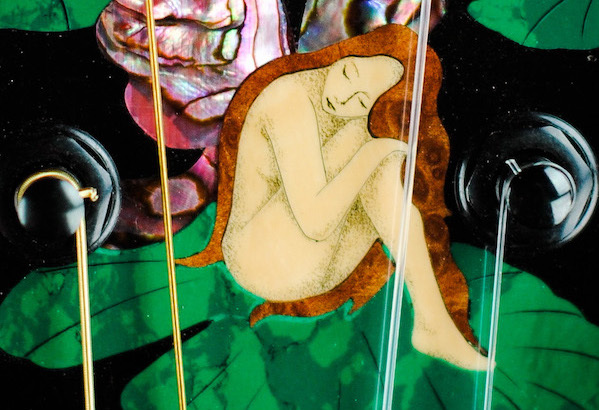 Paua abalone is use unashamedly throughout, adorning the entire front and back of the instrument. The seahorse on the end graft was an afterthought that occurred to me only after I sprayed the first couple of coats of lacquer. The mermaids are made up of composite stone and 10,000 year old fossil mammoth ivory. After the ukulele was finish sanded, I scrimshawed the details in the bodies, remembering the art form I was involved in years ago. 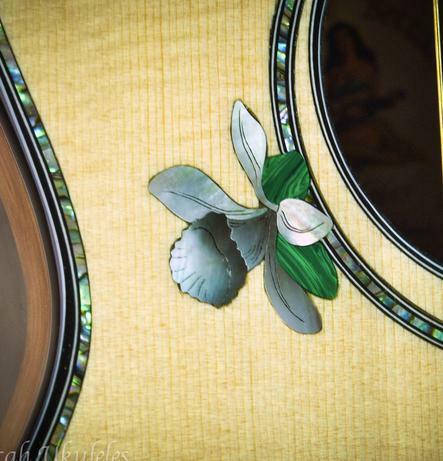 Other inlay materials include gold mother of pearl, abalone shell and fossil walrus ivory. 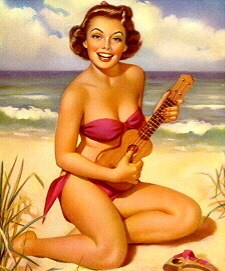 With just one look there is no mistaking that this is a Hawaiian ukulele! 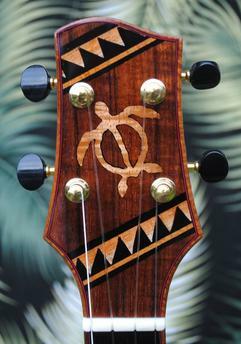 It was especially fun for me to incorporate the "honu"inlay on the "tapa" inspired background, both of which are significant in Pacific Island cultures. 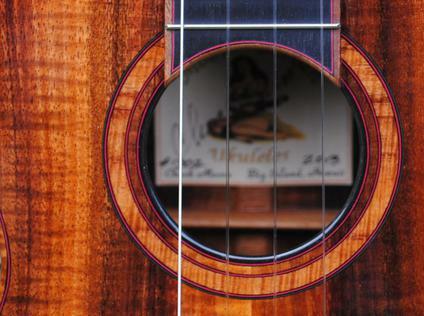 The fine red & black prufling nicely contrasts with the curly koa binding that I've used throught the uke. The side sound port acts as a personal monitor allowing for a bit more player feedback. 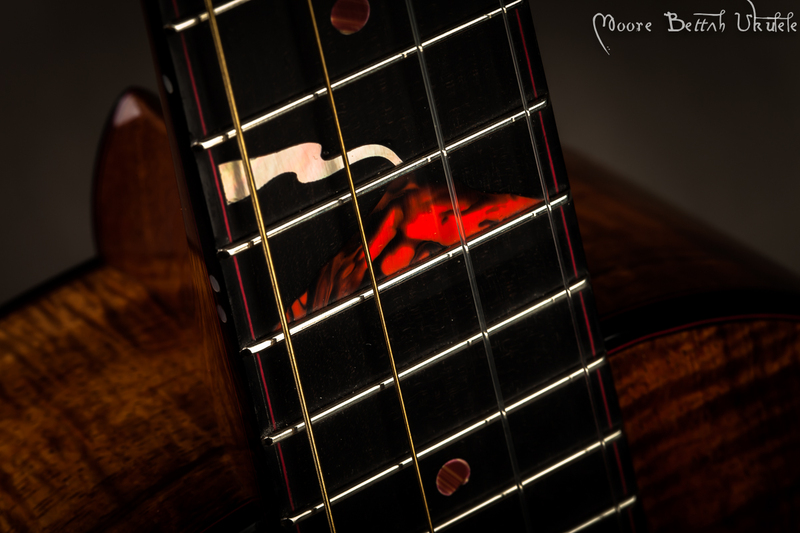 The Spanish cedar neck is reinforced with a carbon fiber rod for added stability and better tonal response. This is a well balanced instrument that has great volume and is an easy, comfortable player. Comes with hard shell case. Shipping with the USA only. 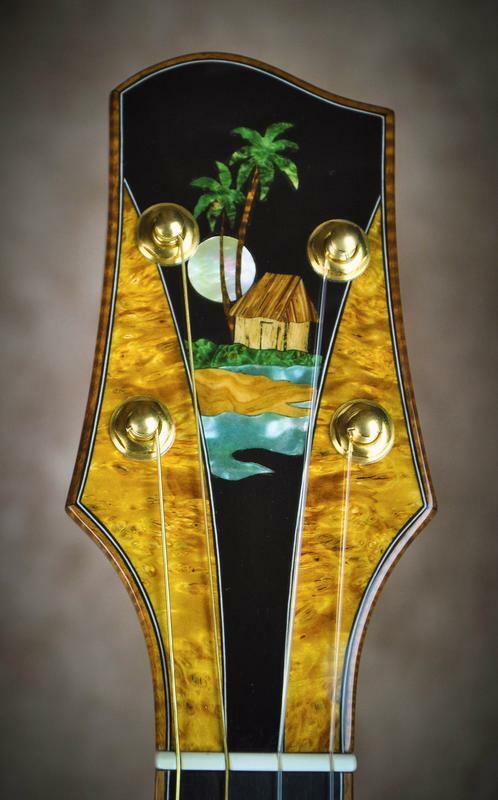 I was interested in the contrasts that the materials of this uke provided me was interested in the contrasts that the materials of this uke provided me; the contrast between the Lutz spruce top and the ebony fingerboard and head stock, and the contrasting heart and sap wood of the Macassar ebony back and sides. 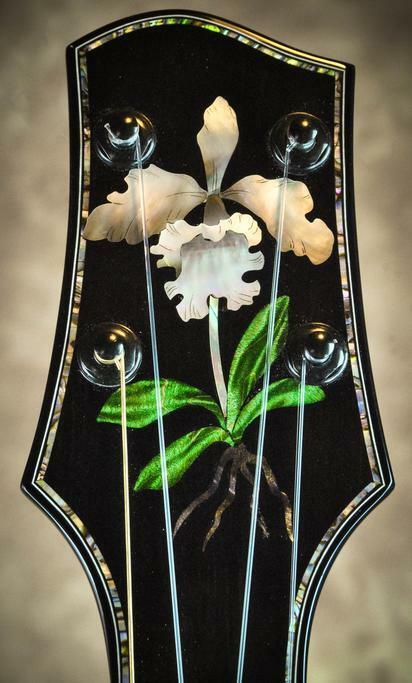 The orchid inlays are done with Tahitian black pearl shell and dyed maple burl. This is set off by the blue paua abalone purflings on the top & back of the body as well as around the headstock. 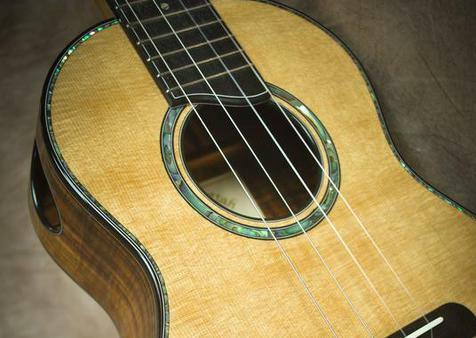 The side sound port makes for easy listening and the transitional arm bevel makes it a comfortable player. 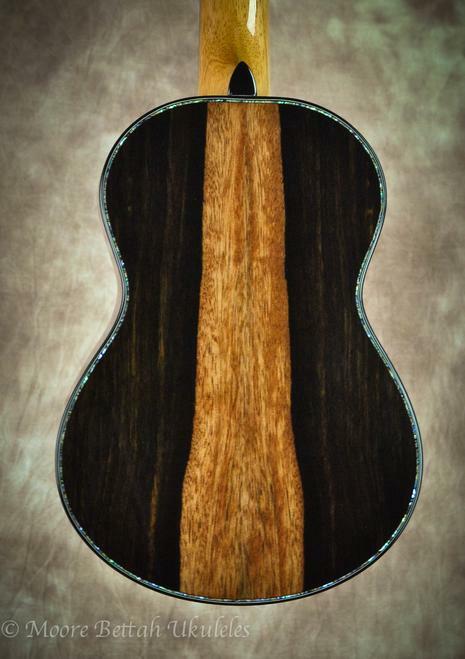 The neck is Spanish cedar with carbon fiber reinforcement. 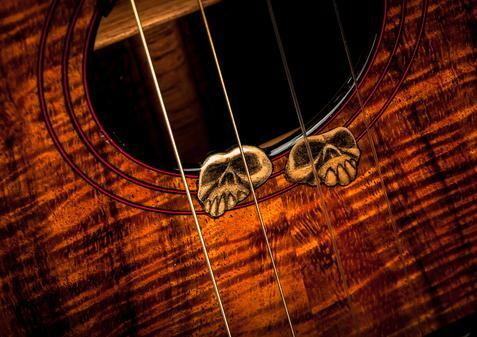 Bone nut & saddle, Grover Sta-Tite tuners, Worth low G strings. 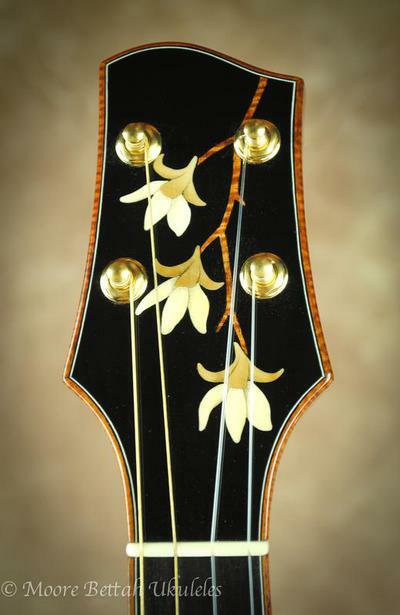 Glossy nitrocellulose lacquer finish. 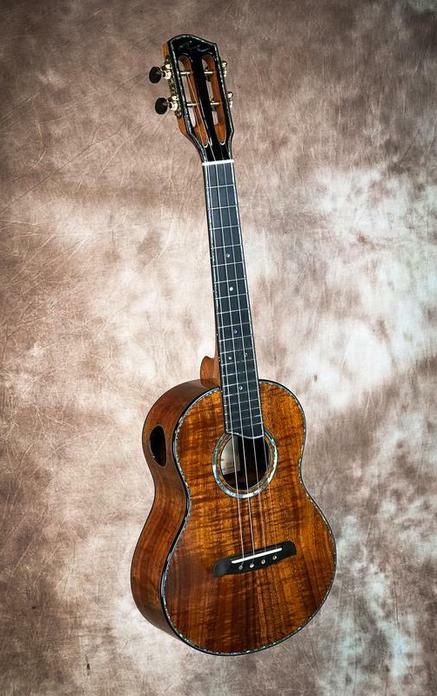 This ukulele has exceptional volume and clarity and is an easy player. 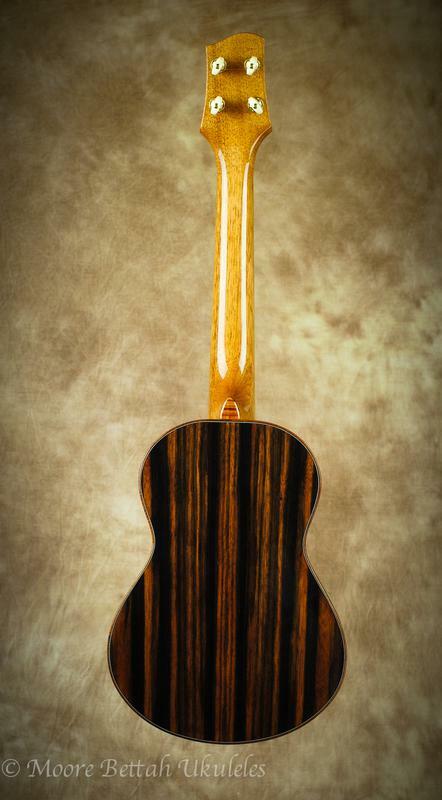 The neck is Spanish cedar with carbon fiber reinforcement. Bone nut & saddle, Gotoh UPT tuners, Oasis low G strings. 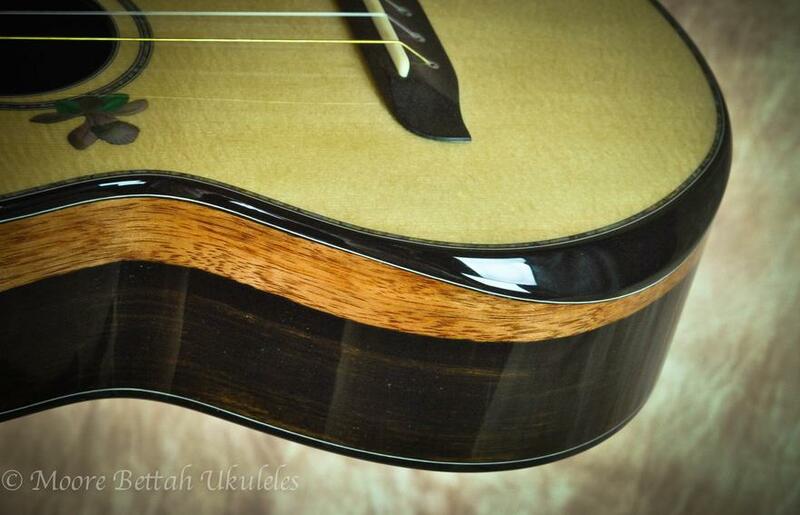 Glossy nitrocellulose lacquer finish. 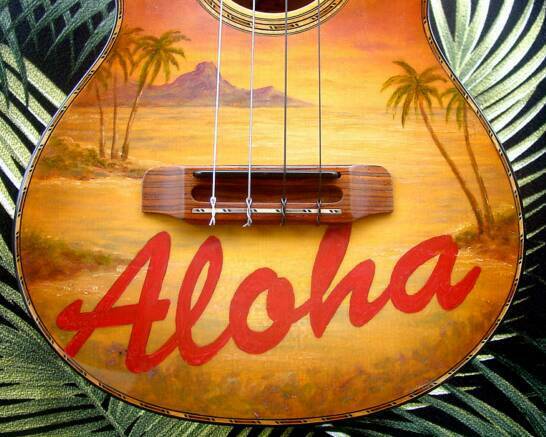 This ukulele has exceptional volume and clarity and is an easy player. Comes with hard shell case. Shipping via USPS Express mail to US destinations is approximately $100. 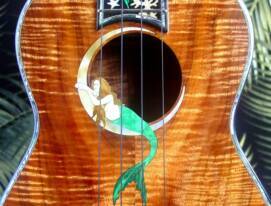 This fantasy uke was inspired by the pond we have next to the shop. It's filled with white and pink lotus blossoms and attracts a lot of dragonflies. I only ever seem to get a fleeting glimpse of the fairies, so that depiction is largely from my imagination. This particular fairy was made of 40,000 year old mastodon ivory in which I've scrimshawed the details. 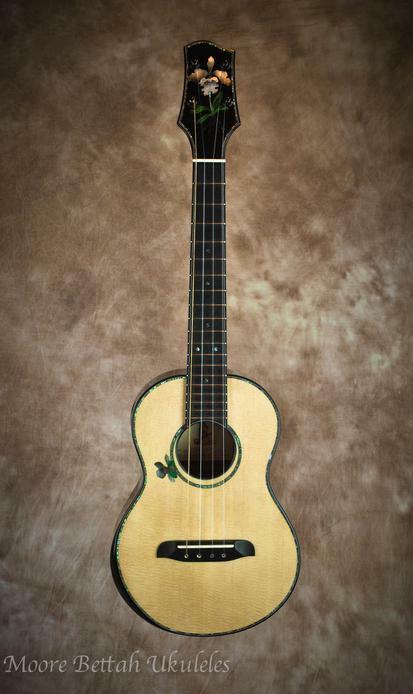 This is truly a magical ukulele with an exceptional sound. 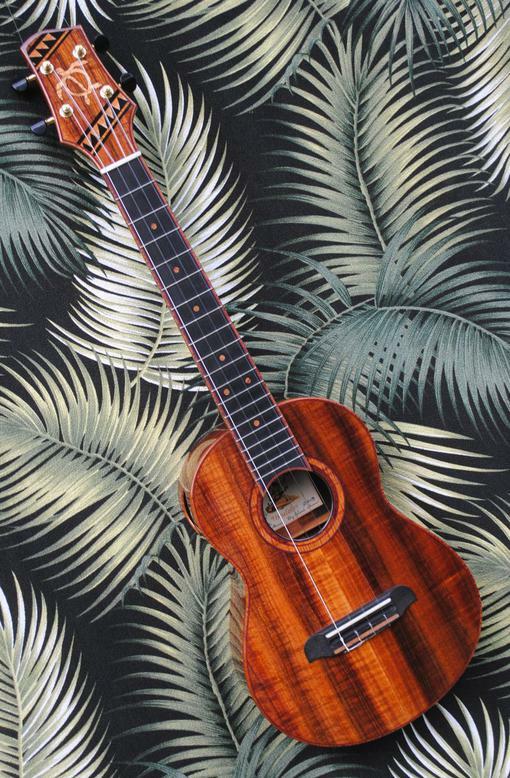 This uke is currently available through Hawaii Music Supply. Please contact them for purchasing details. 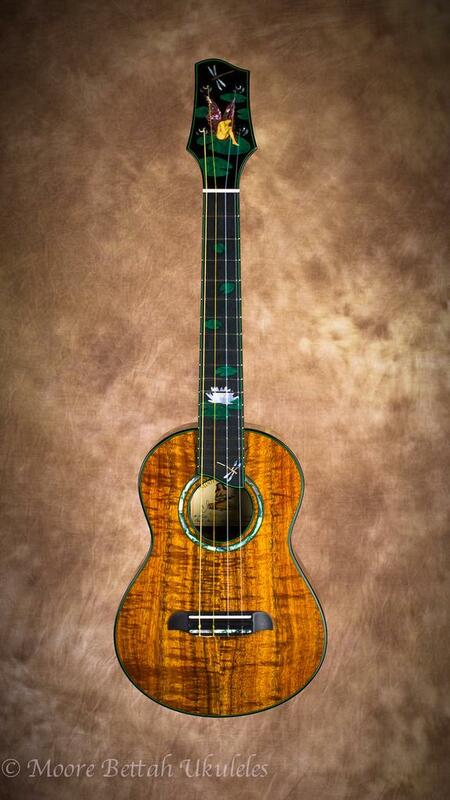 This collectors ukulele is now available through Hawaii Music Supply. 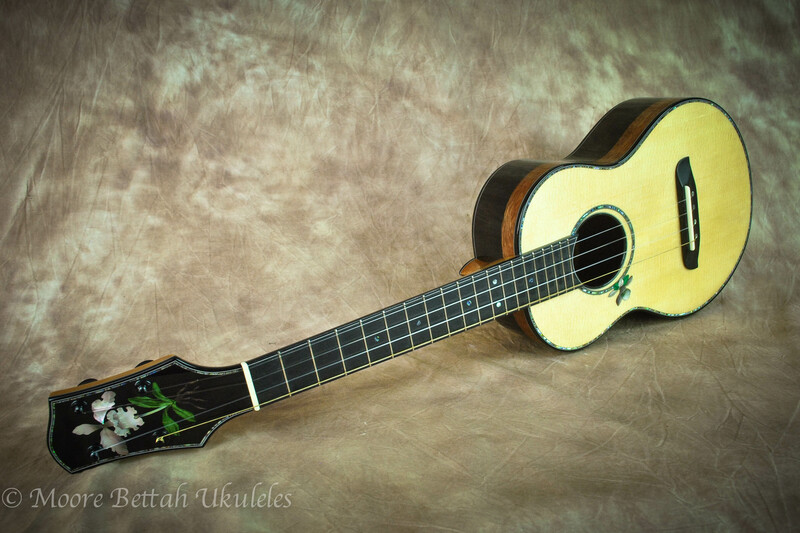 See more photos and read their review here: http://theukulelereview.com/2014/04/26/moore-bettah-tiki-island/ Big Mahalos to Andrew Kitakis, Corey, and the staff at Hawaii Music Supply. 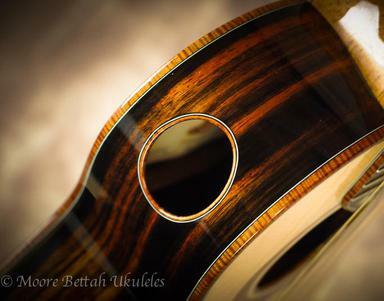 This uke is a bit of a departure for me, combining Macassar ebony with bearclaw spruce. While you might agree that it's gorgeous to look at, what really surprised me was the tone. It's bright and punchy yet full at the same time. 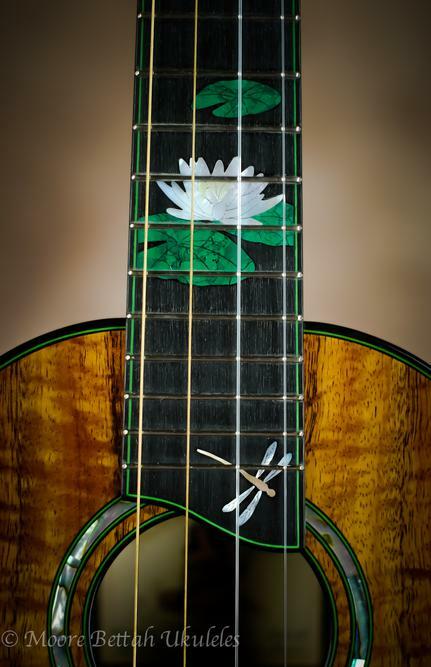 The wild orchid inlays, even though they are different colors, were made from the same piece of fossil mammoth ivory (40,000 years old.) 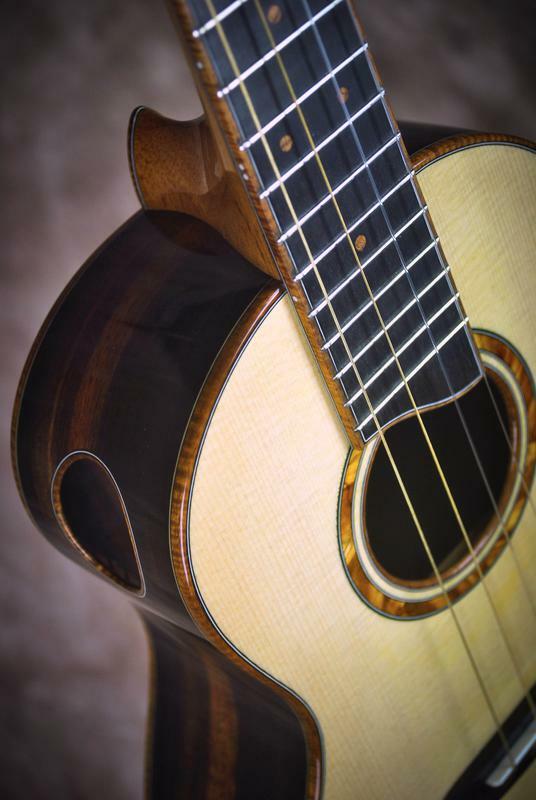 The curly koa accents add to the stunning statement that this uke is, both as an excellent player and object d'art. 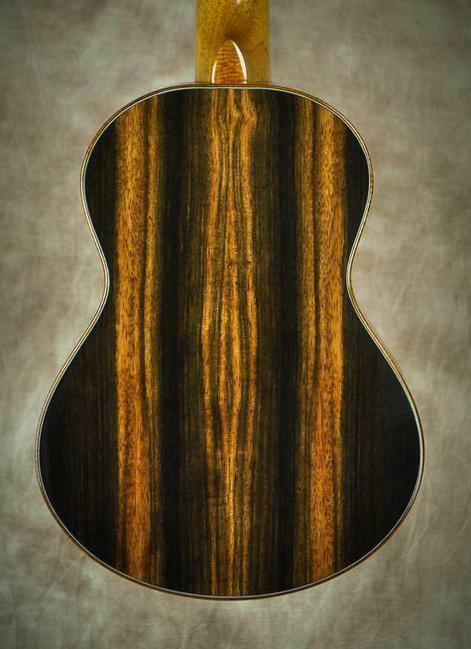 For the first time I've combined koa with and exceptional "waterfall spruce" top. This unique spruce comes from British Columbia and it excells in it's sonic properties. Combined with this particularly dense ands hard koa it is brilliant and punchy with great volume. 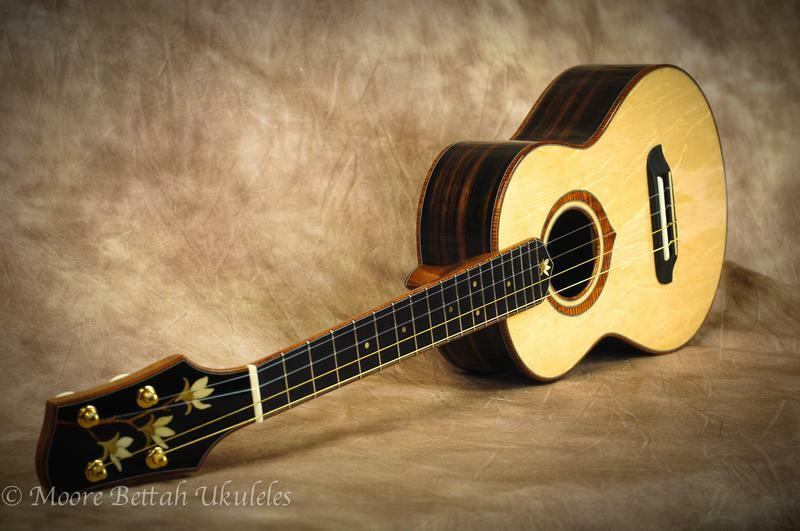 This ukulele features a couple of my best selling options, a slotted head stock and side sound port. 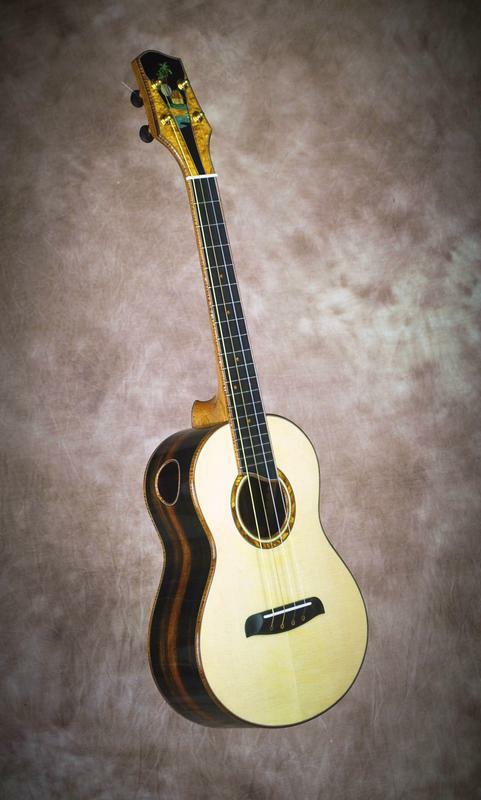 As of earlier last year all of my ukes also have a wider lower bout, string-through bridge and improved bracing. 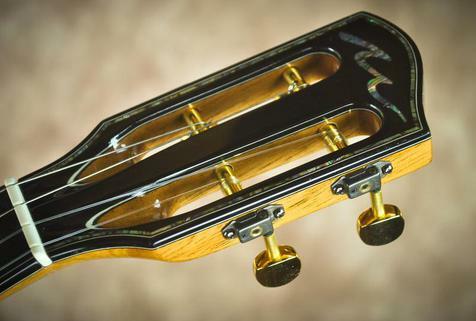 I've used Gotoh Stealth tuners which keeps the head stock light and lower in profile. Strung low G with wound basses. Hard shell case in included. Shipping (+$175) within the USA only. Macassar ebony and Adirondack spruce are quickly becoming some of my favorite woods to build with. 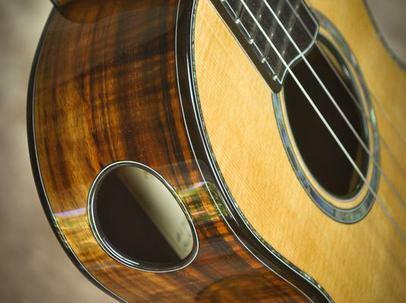 Spend a few minutes with this ukulele and you'll understand why, it has such colorful dynamics and a large volume tone. 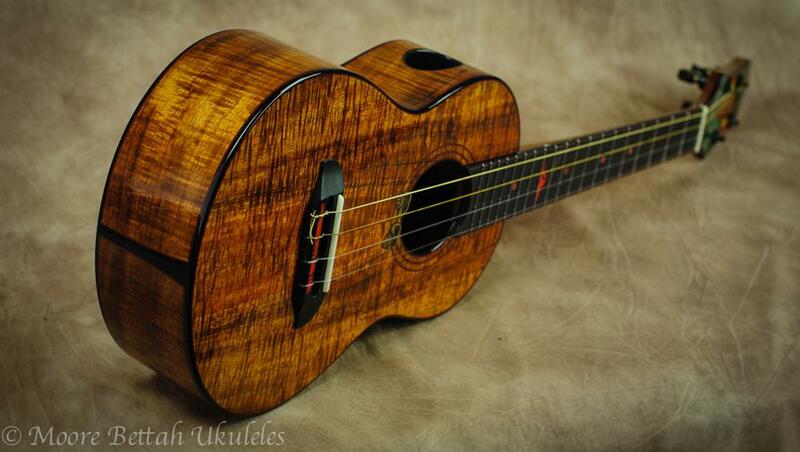 It's also stunning to look at especially with the curly koa accents. The headstock inlay features a tranquil moonlit lagoon-side scene inlaid with woods and pearl shell. Strung low G with wound basses. Hard shell case in included. Shipping (+$140) within the USA only.